Today, Jan. 8, marks David Bowie’s birthday. We’ve noted Bowie’s birthday here before, purely as an afterthought in conjunction with the fact it’s also Elvis Presley’s birthday. But we focused on Elvis last time, and today’s it’s Bowie’s turn. Bowie wrote and recorded with, covered and befriended John, performed with Paul, covered George and at least hung out with Ringo (were we all so blessed). According to Tony Visconti, David’s friendship with John developed to such a degree that the three of them often spent a night on the town together. “We stayed up with John Lennon until 10:30 a.m. We did mountains of cocaine, it looked like the Matterhorn, obscenely big, and four open bottles of cognac,” Tony recalled. … John and David bonded over drugs, music, and a shared quirky British sense of humor. In addition to having crossed paths to varying degrees with each of the members of the band, Bowie was deeply influenced and inspired by The Beatles, and when you try hard enough, you can hear it throughout his extensive catalog. Additionally, Ken Scott was a shared link in the studio, engineering Magical Mystery Tour and the White Album while engineering and/or producing Bowie from 1969-1973. (Visconti worked with John and Paul, too, after he first worked with Bowie). After a lifetime of enjoying rock music, it somehow took until my 40th year to fully immerse myself into Bowie’s music. This is not to say I wasn’t a fan, or didn’t enjoy various releases over the years. But in 2014 I really became a superfan, getting completely absorbed into his music. Part of that immersion was to visit the truly incredible David Bowie Is exhibition that recently closed at Chicago’s Museum of Contemporary Art. Comprehensive and engrossing, I was blissfully overwhelmed. Among the artifacts near the beginning of the exhibit was a newspaper: the Times of London showing the Earthrise, the iconic image from Apollo 8 that shows, well, the earth rising as viewed from the moon. The photo was taken Dec. 24, 1968, but was published in a special insert in the Times on Jan. 6, 1969. According to the exhibit, after seeing the paper, Bowie had “Space Oddity” written within a week. Especially when you place yourself into that era, it’s a moving image, the blue earth rising above the moon, but that’s not what jumped out at me. And if you happened to be at the MCA that morning in mid-November and heard someone muttering, “I’ll play, you know, whatever you want me to play,” and wondered who it was, that would be me. Because on Jan. 6, 1969, David Bowie was inspired to begin writing “Space Oddity” at the precise moment The Beatles were bickering over how to rehearse “Two of Us” just miles away at Twickenham. The Nagra tapes didn’t roll 24/7 in the lives of John, Paul, George and Ringo from Jan. 2-31, so we certainly can’t say the Apollo mission — or any other particular news event — did or didn’t inspire or influence the band. The group touched on politics, immigration in particular, in outtakes like the “No Pakistanis” version of “Get Back” and “Commonwealth” at various points during the Get Back sessions (writeups to come! ), and it’s not as if The Beatles didn’t have a history of being social commentators. But I found it illustrative with regards to where these different acts were at this very specific moment in time — Jan. 6, 1969 — that David Bowie was able to find a muse that would launch him into stardom for the first time just as The Beatles found themselves trapped –Planet Earth is blue, and there’s nothing The Beatles could do. Between the time Bowie started writing “Space Oddity” on Jan. 6 and finished it on the 13th, George would suggest the band “have a divorce” after an open discussion recounting how bad things have been for a year (Jan. 7), and then he’d end up quitting (Jan. 10). The Twickenham sessions ended Jan. 14. I certainly won’t argue The Beatles were out of ideas in January 1969; This entire blog is predicated on the idea the group remained vibrant and vital during the Get Back sessions. But it’s obvious any success they had was despite themselves. The songs they wrote or worked on this month were works of art, to varying degrees, but it was often tantamount to climbing up the hill backwards, as Bowie would put it, to get anything done. We’d have lost Abbey Road and Let It Be (although you’d assume many of the songs would later resurface on solo records) but an argument can be made John and George, at least, would have been happier people had The Beatles ceased to exist sometime in 1968. Is the difference tangible between a band being pulled apart and an artist ready to burst? Oh boy, is it ever. Used in conjunction with the BBC’s Apollo 11 moon landing coverage in July 1969, “Space Oddity” made a name of Bowie just as The Beatles were in the thick of recording Abbey Road. (About 12 hours after man first walked on the moon, The Beatles began recording “Come Together”). By the time Bowie’s eponymous LP featuring “Space Oddity” was released that November, The Beatles were effectively finished. Five years (what a surprise) later, after meeting John at a party, the Starman ultimately entered the orbit of The Beatles. 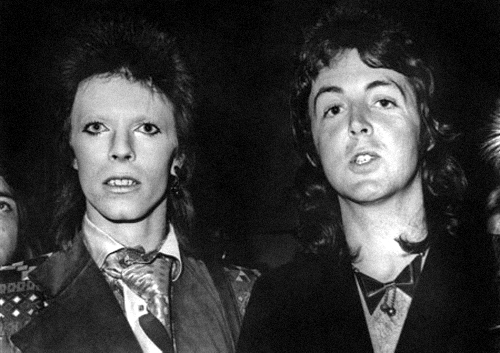 Hard to imagine two artists with such different aesthetics, but bowie and the beatles shared a relentless hunger for innovation.